This article is not a reprint of the QST manuscript. Corrections and additional information not present in the original article are here. design process for two LPs that cover the HF bands from 10-30 MHz. How do you go about achieving good DX performance on all HF amateur bands from 10 to 30 MHz without using separate antennas for each band? One alternative that occurred to me was the log periodic (LP) antenna. Although I thought that the penalty for using this type of antenna was poor front-to-back (F/B) ratio and forward gain when compared to other antennas, I decided to take a closer look. "...the antenna isn't one of the important things in an amateur station, it is the ONLY thing..."
I had used three-element monoband Yagi antennas for years and considered them to be good DX antennas, so I chose that design as the performance standard for comparison. Using modeling software, I tested several log periodic antennas of six to eight elements with boom lengths of 16 to 20 feet. The software confirmed that these antennas were inferior, just as I expected. I wondered if more elements and a longer boom would work better and found that longer boom log periodic antennas with more elements work much better. The antenna modeling software I used for this project is NEC-WIRES, NEC-2 based software from K6STI , and Nec-Win Plus+, a Windows-based product from Nittany Scientific . If you choose to use other software to model log periodic antennas, make sure the software will correctly model the phasing transmission line that runs down the center of the boom and connects each element together. 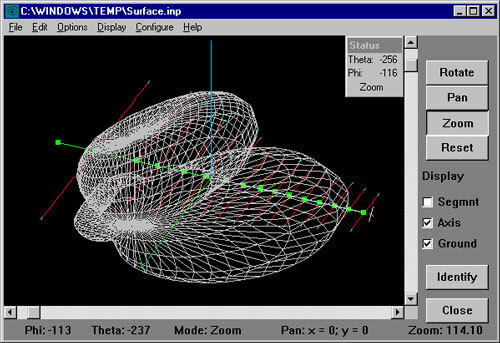 NEC-2 antenna models use the "TL" (transmission line) facility for modeling, which produces a non-radiating, lossless mathematical transmission line for the model. I tested dozens of various log periodic arrays--from very small ones to those with impractical long booms. As the boom length and number of elements increased, the front-to-back ratio (F/B) became respectable. My eventual antenna design had about the same characteristics of a three-element monoband antenna, with the advantage of a single feed line. Some log periodic antennas have reduced performance at each end of the desired frequency span. This is because few elements are active at the frequency extremes to provide good gain and F/B. Some antenna designers have resorted to using passive reflectors or directors to boost performance. I tried to modify the antenna element spacing and lengths of traditional log periodic designs and was able to successfully optimize the antenna to give good 14-30 MHz performance without requiring additional passive elements. The optimized antenna has 13 elements and a boom length of about 38 feet. I still wanted 30-meter coverage, so I created a second antenna by adding two more elements, lengthened the boom, and optimized again for the 30-meter band. The new design had a boom length of 48 feet. 30-meter performance was down somewhat from the standard 3-element monoband antenna--within 1/2 dB in forward gain and a good F/B of 20 dB. Since only two elements were added to give this additional coverage, I decided that reduced forward gain was acceptable. Sweeping the design frequency in steps of 100 kHz and tabulating the results across the entire operating bandwidth resulted in the gain and F/B plots shown in Figure 1 and Figure 2. It's interesting to note the 30-meter performance of the antenna. Only two elements have been added to give coverage for this band, but the forward gain falls midway between that of a two and three element monoband Yagi. F/B is 20 dB, which is 8 dB better than a two-element monoband Yagi and almost as good as a full-sized three-element Yagi at 25 dB. A recently published article  stated that all elements in a log periodic antenna are active at all frequencies. All elements are active forward of the one most active at any given frequency. Figure 9 shows a modeling software graphic of element current magnitudes when the array is operating at 10.1 MHz. Significant element current at this frequency is present on some elements other than the two added for 30-meters. This makes sense and explains the improved 30-meter performance. Another improvement to 10 MHz performance resulted from adding a shorted stub to the rear element. This consists of an electrical length (100% velocity factor) of 78.74 inches of 450 Ohm open-wire transmission line connected to the rear element's antenna terminals with the far end shorted. To get the physical length, multiply this by the line's velocity factor. Adding the stub improves F/B ratio on 30-meters, the band on which the rear element has the most effect, by 9 dB without significant effect on gain or SWR on the other bands. As constructed, the stub is coiled up and attached to the boom with acceptable results. To eliminate interactions in the coiled line or with the boom pipe, the best solution would be to use a lightweight extension of 1-inch diameter PVC pipe fastened to the boom using stainless hose clamps, with the ladder line then taped to the PVC pipe. The resulting pattern and SWR response makes a nice 30-meter antenna. The main feed point impedance of both antennas is 200 Ohms. I matched this value to 50 Ohm coaxial line using a homemade broadband 4:1 toroidal balun suitable for legal limit power operation. 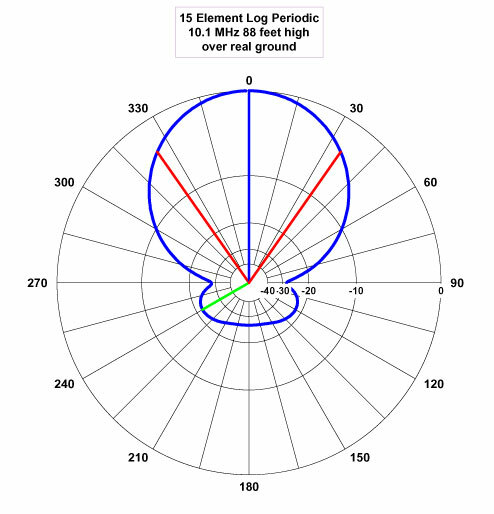 NEC-2 antenna design software uses a single wire of a constant diameter for each element to calculate antenna characteristics. Since most HF antennas require elements of tapering size, a conversion method is required. I used a spreadsheet template from Dave Leeson, W6NL's, Yagi design book  which calculates the conversions from practical elements to their theoretical equivalents. The spreadsheet is constructed with multiple columns--one column per element section. Element section diameters, wall thickness, and lengths are entered. The software does more than just tapered element conversion. Antenna element weight, wind speed survival, ice loading characteristics, and more are calculated as you design each element. Many of Leeson's ideas for Yagi antenna physical design in this book apply directly to log periodic antennas. Reading this book and applying the mechanical design fundamentals along with using the software is recommended without hesitation. Using it, you can make mechanically reliable antennas that perform electrically as intended. Another spreadsheet template is entitled "Calculation of Element Strength and Equivalent Length" which calculates the wind speed survival of an element. My county in Ohio has a 70 MPH requirement . Enter the physical tubing diameters and lengths for the element, adjusting the lengths of each tapered section to keep the calculated reactance as close to 0 W as possible. (When the spreadsheet shows a low reactance, the tapered element is equivalent to the NEC-2 single diameter length.) If the wind speed survival of each element section is at or above your required wind speed survival, and the element section is practical to build, you are done. If not, increase the diameter, wall thickness, or shorten the lengths of individual element sections (always keeping the reactance near zero) until the element design will survive at the required wind speed. High wind speed survival speeds are relatively easy for the shorter elements. Those in the 14 MHz range and below require more care. Once each element is designed, the weight and area calculations of each are then used in another spreadsheet that calculates boom survival characteristics in a similar way. Start with individual elements, and then work on the boom and boom guys. The advantage of this spreadsheet technique is simplicity and speed. You are only working on one element (or boom) at one time, and the spreadsheet runs very quickly, even on older computers. The spreadsheets are provided in Lotus 1-2-3 format (WKS) and will work with practically any spreadsheet program, such as Borland / Corel Quattro Pro or Microsoft EXCEL. This algorithm for tapered element conversion is summarized in the ARRL Antenna Book . The center section of the 10 MHz and the 14-30 MHz elements are different because the larger 10 MHz elements are 50 feet long and require a heavier boom to element mounting method. The tubing diameter of the 14-30 MHz elements is all standardized at an initial 1-inch diameter, while the two 10 MHz elements start out at 2-inches. Each element type has a standardized construction method. All use the same tubing diameters and initial lengths, then taper in a uniform fashion. The individual element's final tip length then determines the resonant frequency. The table of element tubing sizes and dimensions are shown in Table 1. Note that these dimensions are for the exposed lengths of tubing visible after assembly. Four inches of tubing overlap are required for assembly where a smaller tube fits closely into the next larger tube. The larger antenna may be built from the smaller one by just adding a boom extension and two elements. With one exception, the element lengths and boom spacing on the smaller antenna remain the same when the larger antenna components are added. The boom position of the largest element on the smaller antenna moves 10 inches. More details of these changes and the element layout are shown in Figure 4. A log periodic antenna requires each element center to be split and insulated from the supporting boom. The insulating center for the large 2-inch elements is a solid rod of PVC, UHMW, or similar insulating material, 1.875 inches in diameter and 12 inches long. One rod is required for each of the two larger elements note . Since this isn't a standard diameter, it will be necessary to turn a larger diameter rod to this size using a lathe. Most machine shops can handle this job for you. Use a section of 2-inch diameter aluminum tubing to verify proper fit. Thanks to George Crego, WD8ATX, for his expert lathe work in making my insulators. The mechanical drawing for the larger two-inch 10 MHz element is shown in Figure 5. The boom guy detail of Figure 5 shows how 0.25" thick 3-inch aluminum angle is used as the basis for the boom guy anchors. Galvanized 1-inch closed-end eyebolts are attached to the aluminum angle, which is attached to the boom using one McMaster #8896T57 3-inch stainless U-bolt clamp. One U-bolt is required for each boom guy. Two identical U-bolts are also used to attach the 2-inch element mounting bracket to the boom. Surrounding the aluminum element is a 12-inch long piece of schedule 40 PVC pipe with a 1/4-inch slit cut lengthwise in it. This allows the PVC pipe to compress securely around the aluminum element. A pair of ¼" x 20 x 2.5-inch long stainless steel machine screws with double nuts serve as terminals to connect the phasing transmission line. This assembly is then mounted using four McMaster # 3042T57 stainless U-bolts on a support plate made of 3-inch aluminum angle, 8-inches long. These two larger elements are about 50 feet long, and this mounting arrangement has proven to be trouble-free. All elements are mounted below the boom. The insulating center for the smaller 14-30 MHz elements was originally made with a custom designed UHMW polyethylene block with an integral ultraviolet light inhibitor that has worked well in this application. To make it easier for others to duplicate this antenna design, I have redefined the elements to now use commercially available components . The mechanical drawing for the smaller 14-30 MHz element is shown in Figure 6. The construction method for the smaller elements uses similar, but smaller components. A 7/8-inch diameter solid fiberglass rod fits inside the two 1-inch diameter aluminum element ends. One-inch PVC pipe with a 1/4-inch slot cut lengthwise fits around each tubing end. This assembly is supported by two aluminum saddles that mount on a flat 1/4-inch thick aluminum plate which measures 8 x 3.5 inches. Stainless machine screws with double nuts serve as the element electrical terminals. The entire element plate assembly is held to the boom using two McMaster # 8896T57 stainless U-bolts. Closed-end 1/8-inch aluminum pop rivets are used to join the overlapping tubing sections together. Two were used to join the smallest sizes, while eight were used for the largest. Just prior to assembly, coat the overlapping area with a thin coating of aluminum joint compound (Penetrox or equivalent) to inhibit corrosion between the aluminum tubing sections. Stainless or galvanized hardware is used throughout, not just on the electrical connections. I chose a boom diameter of three inches for both antennas. The mechanical properties of this boom were tested using the mechanical design template from W6NL's book. Boom guys are necessary to keep the boom straight. I checked for possible interaction between the metal boom guy wires and the elements using the NEC-2 design software. No problems were discovered, probably because the guys are parallel to the boom and at a right angle to the elements. This eliminates the need for Kevlar guy cable. For these antennas, 3/16-inch EHS guy wire works well. Use the mating grips for clean and good looking boom guys. The booms are 6061-T6 aluminum, 3-inch OD x 0.125-inch wall. I used two 24-foot pieces of 3-inch diameter aluminum pipe for the 48-foot boom. The 38-foot boom was made with a 24-foot piece joined to a 14-foot piece. I connected both boom pieces together using a larger outside pipe as a coupler between each section. The boom coupler is made of a 2-foot length of 6061-T6 schedule 40 aluminum pipe which is 3.5-inch OD x 0.216-inch wall. Pipe doesn't fit closely like tubing does, but the joint was close enough to be practical. I considered using .025-inch thin metal shims to make up for the somewhat loose connection, but it wasn't necessary. Use two 2 x 13 x 5 inch galvanized bolts at right angles through the entire boom joint to secure the boom splice section to each boom end. Four boom bolts are required for each antenna. Alternately, consider making a 24-inch long solid center internal boom splice. This would be somewhat harder to drill through for the boom bolts, but it would result in a cleaner design. It would require machining on a lathe to make it fit the inside diameter of the main boom. Any boom sag resulting from a slightly loose boom joint is removed when the boom guys are tightened. Boom guy tension is determined by hanging the antenna at the center of gravity from a cable. With the antenna elements level, sight along the boom and adjust the turnbuckles until it looks straight. The larger 48-foot boom requires four boom guys, while the 38-foot version needs only two. Once in the air, the perfectly straight boom looks great and it stays that way. The mechanical drawing for the boom couplers and vertical guy support is shown in Figure 7. An alternative to the boom support and tower to boom plate is commercially available . Make sure to align the eyebolt holes in the vertical boom support to be directly over the boom. This will prevent the boom from bowing when the turnbuckles are adjusted. 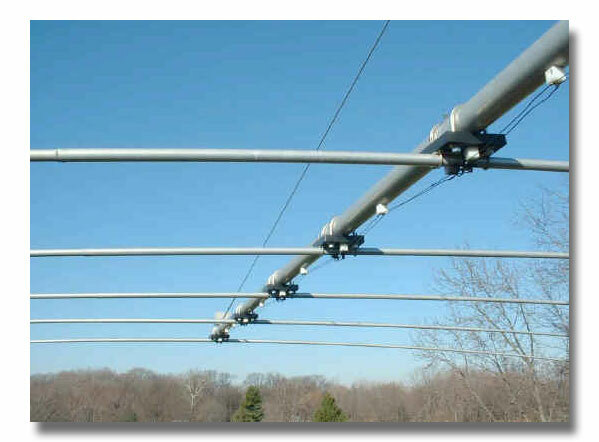 Two 1/2-inch by 12-inch galvanized turnbuckles are used for the 38-foot boom antenna. The 48-foot boom version requires four turnbuckles and eye bolts. The vertical boom support is fabricated from a single 2-foot length of 1/4-inch thick, 3-inch aluminum angle. The characteristic impedance of the element phasing transmission line is 325 ohms. This value was chosen for best SWR performance as shown in Figure 8. The measured results agree closely with this graph. I made this using 14-gauge solid copper wire with a spacing of 1/2-inch. I made small insulating standoffs from a plastic block and supported the wires every 18 inches along the boom. Keep the wire spacing close to the desired 1/2-inch spacing and support the phasing line an inch from the boom. To make this phasing line easier to fabricate, consider using commercially available high power 300-Ohm twin lead . Don't use the common TV variety or the commonly available 450 Ohm open-wire line. Remember to alternately connect each element center 180 degrees out of phase with the next element by flipping the twin lead one-half turn between elements. Repeat this phasing procedure for all elements. Keep the phasing line spaced an inch from the boom. The feed-point balun is made using 11 bifilar turns of 14 gauge Teflon-covered wire wound on a relatively low permeability F240-67 ferrite core that fits inside a PVC pipe for weather resistance . Commercial alternatives are also available . The two antennas were mounted on a 100-foot tall RTS rotating tower made of Rohn 55 tower sections. 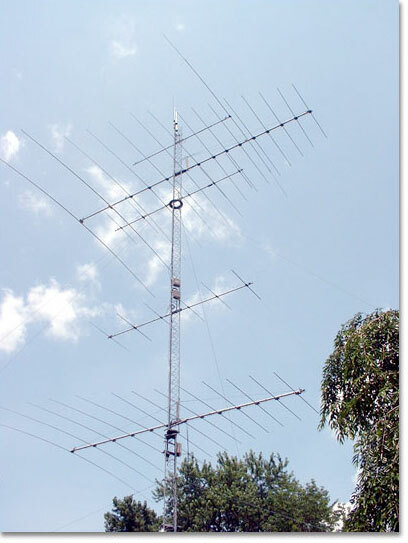 On 14-30 MHz I have a stacked array of the two antennas, with the 48-foot boom antenna at a height of 88 feet, and the 38-foot boom antenna at a height of 44 feet, for a separation of 44 feet. (See stacking notes). On 30 meters, I have a single gain antenna at a height of 88 feet. Tower guy wire placement prevented the stacking of two identical larger antennas. The boom-to-tower mount is a flat aluminum plate 24 x 12 x 0.25 inches thick. The antenna mounts to it using four 3.5-inch U-bolts that fit around the boom section coupling. The plate is secured to the tower using U-bolts that fit the Rohn 55 tower legs. A similar plate could be used to make a mount for a single vertical mast . A homemade bottom-both-upper antenna switch using vacuum relays and a stack matching network allows flexible antenna switching. The best sources I have found for the aluminum tubing elements are the advertisers in QST. They were cheaper than a local supplier, and they had all sizes necessary for these antennas. I have had good luck using the 6083 alloy. The six-foot sizes required for these antennas may be shipped by UPS. I found the long aluminum pipes for the boom at a local supplier. It costs a lot to ship this material, so look for it locally first. The stainless U-bolt hardware may be hard to find locally. Specific U-bolts used in these antennas are identified on the mechanical drawings with the supplier's part number. Other sources may be helpful in supplying these and other necessary parts. I'm happy with these antennas since they meet my design objective. The performance of the large antenna on 30-meters has been gratifying. Prior antennas on this band were dipoles or verticals. Going to a gain antenna with a good F/B was a pleasant change. These antennas have been in service since 1995. No problems have since developed, due in part to the mechanical design method and conservative construction. No maintenance of any kind has been necessary. Electrical performance has been very good, and the flexible stack arrangement and independent antenna selection have proven to be useful. 3. L.B. Cebic, W4RNL, "Notes on Standard Design LPDAs for 3-30 MHz PT2: 164-Foot Boom Designs" QEX, July/August 2000, p 17. 4. David B. Leeson, W6QHS, "Physical Design of Yagi Antennas", 1992. 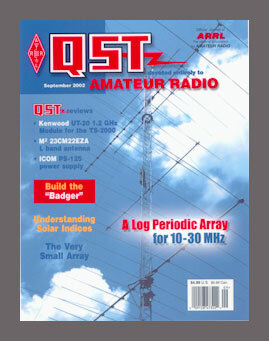 This book and software are available from the ARRL. The book is ARRL # 3819. The software on floppy disk is available separately as #3827 IBM PC or #3843 Macintosh. As a convience to readers of this article, permission to download this software (in IBM PC format) has been granted by the ARRL. To download this software, click here. 5. Ibid, Figure 2-3 Page 2-8. My tower installation was independently evaluated by a registered PE who also used this local wind speed number. 6. R. Dean Straw, ed., The ARRL Antenna Book, 18th Ed. (Newington:ARRL, 1997), pg 2-15. 9. High power 300 ohm #18 ladder line (#562) is available from The RF Connection This is 19 strands of Cu-clad with poly jacket. 10. Jerry Sevick, W2FMI, "Transmission Line Transformers" ARRL, 1987, section 8-3. 11. An assembled high power 4:1 balun is available from Amidon as part number W2FMI 4:1-HBHT200. 12. 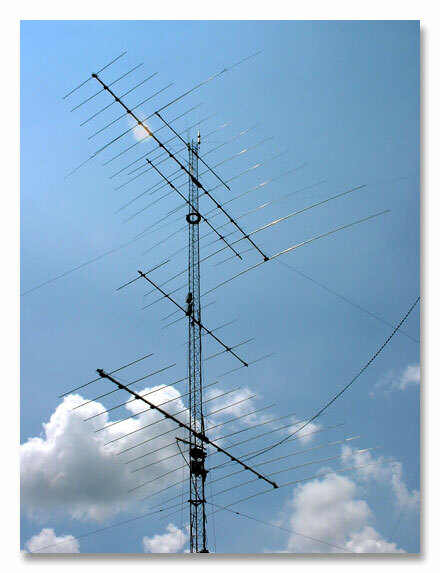 The ARRL Antenna Book chapter on construction and antenna materials contains alternative construction methods and many helpful hints on other related topics. Aluminum tubing specifications, element assembly, element clamping techniques, tips on antenna longevity and more are discussed in detail. Get single file download of all available mechanical drawings. Question - I have a question about element size here in my country. We do not have the same sizes for the elements. Our tubing sizes are metric: (All in mm). So this is what I can build with, does a different size change the element lenghts? Answer - Changing the diameter of an element will change the length required for an element. I will give you some more information to make it easier to understand how to design new elements using tubing sizes available in your specific country. In this article, examine Figure 3, aluminum tubing construction lengths. Notice that each element has a resonant frequency specified. To use your Metric size aluminum tubing, select a diameter closest to the specified value in inches. Enter the metric sizes and lengths into the spreadsheet program named Element.wk1. Enter the specified element resonance. Then adjust your metric length until the element reactance calculated by the spreadsheet is less than one Ohm. Then, if the element survives your desired wind speed requirement, and is practical to build, you are done. If the reactance is too high, add or subtract from your new metric lengths to make the reactance less than one Ohm. Repeat this procedure for each element. Download the free software, and run using any spreadsheet program. Enter the lengths and diameters you have available, then practice changing the element lengths to see the effect on element resonant frequency. To help you, I have made this metric design available. Click here to see the table in metric dimensions. Question - Im thinking of making a long boom log for 10 thru 30 MHz. I have some boom from two old antennas. I also have 12 of the center insulators KLM used for their old log periodic design. Maybe your way with the solid rod thru the center may be stronger. I wonder if I could maybe make even one a bit longer to use up the 64ft boom I have. I could use any help you could give me. Are there any plans for the design of this log for me to follow? Answer - The 12 insulators you have now will probably work if they will fit the tubing diameter I used for my log design. If the tubing diameter is different, you will need to design new elements similar to the question above. However, you will need to make heavy duty boom to element clamps similar to the ones I described for the two larger 30 meter elements. I am not aware of any detailed design information for a boom of 64 feet in length. If you want to go for a long boom of this length, you will need to design your own antenna. If you go this way, I suggest using the software tools and design method I outlined in this log periodic antenna article.